Traveling in a different country should not only include site-seeing and shopping. If you want to truly enjoy the flavor of a new country you have to mix with the locals, learn about their culture, their history and heritage, absorb their daily lifestyle and most importantly try their traditional food. Only then you can get the most out of travelling. The Spanish are one of the proudest nations in the world with glorious and fascinating history and they are pioneers of the modern world. You will find plenty of customs and culture to know and learn about Spain. Here we will learn about a famous traditional food in the north of Spain name Pintxos. If you ever are lucky enough to walk the Camino through the regions of northern Spain where Pintxos are most prevalent never miss an opportunity to try them. Pintxos is one of the most popular snacks in Spain; it is more prominent in Northern Spain. It is usually served in the cafes and bars of northern Spain like La Rioja region, Navarre, Bilbao and other northern regions. Spain has 17 regions and each of them has different culture and traditions. Pintxos is a food which cannot be considered as a meal, but it can solve the hunger in between lunch and dinner. People often get confused and mix two traditional foods, Tapas and Pintxos. Well, they are kind of similar but not the same. Pintxos are smaller in size and have a different origin. The word Pintxos originates from the Spanish word pinchar. It means to stab or poke anything. Pintxos; pronounced “Pinchos” in the northern regions and in the Basque country. Pintxos or Pinchos is found all over the northern region but La Rioja, Navarre, and Basque country are famous for their variety of pintxos culture. Where Will You Find Pintxos? Just walk into any bar and you will find the counter decorated with a variety of pintxos. You will find the most conventional tortilla pintxos as well as different cuisine experiments on this food item. Most of the bars and taverns will offer you cold pintxos. Some will warm them up after your order. But if you want to get the real taste of pintxos, you should go to a specialized pintxos bar. Don’t worry, this kind of bar is very available in each corner all across the north of Spain. 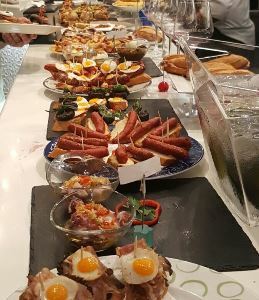 These specialized pintxos bars have special menus where food is cooked freshly and you will get the fresh and warm taste. It goes without saying they are costlier but well worth of it. In the pintxos bar, they usually follow two ways of serving. The first one is self-serving. Take an empty plate, have the pintxos you want and at the end, tell the cashier or waiter the total amount of servings you had. The bill will be made according to your consumed pintxos. But in some bars, you have to tell the waiter what you want and how you want it. The waiter will serve it to you once it is made up. The Camino de Santiago covers much ground and many regions of Spain so you can have a delicious journey with different traditional Spanish foods from breakfast to dinner. 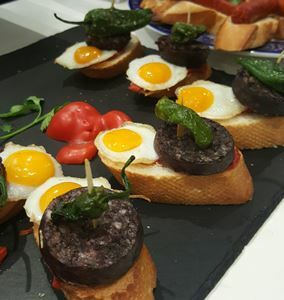 Pintxos is considered a snack or appetizer which people take in the bar with a drink similar to tapas but generally smaller in size and much more detailed. If you want to try pintxos on the Camino we recommend stopping off in some of the authentic bars along the route. 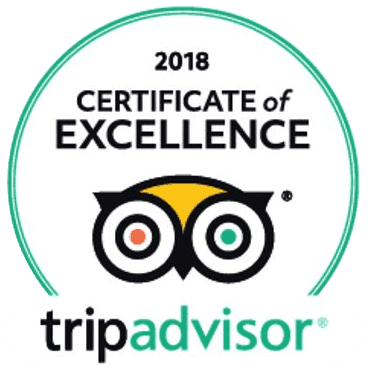 This is the most real and authentic way to sample the culture and the pintxos on the Camino. Pintxos in the smaller towns might only be a snack served with a few olives or nuts, but in bigger towns and cities the variety is ample and a feast for the eyes. The big cities like Santiago de Compostela, Pamplona, Logrono is famous for its variety and taste of pintxos on the Camino. You will find both cold and warm pintxos with different ingredients according to your taste like, seafood, cheese, vegetables, egg and sometimes decorated with multiple colored tasty sauces. If you ever visit and leave without tasting any pintxos on the Camino, well, that’s just a shame. The numerous bars along the Camino are waiting for you with a variety of pintxos dishes. Crawl through the bars, try out different appetizers, talk with the locals and have some chats with them. Pintxos is a very small snack; a person can usually eat a 3 to 5 piece in one sitting. The Spanish culture recommends going with friends and family with such bars and sharing your moments. If you want to enjoy the real pintxos on the Camino, you have to hop from one bar to another bar. There are a number of bars, just have one or two pintxos in each. Thus, you can try out different flavors and places along Camino de Santiago. Every chef wants to do some experiments with their pintxos and thus new exquisite pintxos come in front of you. Every flavor has its own characteristics not to be missed. Pintxos and tapas are similar but not the same. The basic difference is, pintxos are a local dish of the northern Spain and served on a stick which holds them together. They are usually pre-made and arranged on the counter. Pintxos are more similar to a posh version of a finger food whereas tapas are bigger portions. In Spanish culture, it is not always necessary to leave a tip. You can surely tip a waiter if he shows extraordinary attention to you and provide exquisite service. Like many countries in the word, it is not a must in Spain. When travelling, if you don’t try their food, your travel will be incomplete, especially a place like Spain, where the local food has international admiration for awesome flavor and marvelous taste. If you visit the Camino de Santiago, do not forget to step into different pintxos bars as every bar will offer you different pintxos. Pintxos on the Camino de Santiago is one of the many great attractions for the international as well as local tourist. Buen Camino!